Gasparilla Island offers 7 miles of pure tranquility; a barrier island with no rises or traffic lights, a 100 year old light house, and pristine white sand beaches- where golf carts out number cars. Boca Grande is surrounded by the turquoise waters of the Gulf of Mexico, and the protected waterways of Charlotte Harbor, Boca Grande is an old Florida paradise. Known as the tarpon capital of the world this area is home to some of best sport fishing in the world. It's unique charm and historic past make it a very special retreat. From the islands early phosphate days to being host to families as the DuPonts and J.P. Morgan, Boca Grande is rich in American culture and history. Gasparilla Island offers many luxury island style communities, ranging from single family beach front homes, historic in-town cottages, to exclusive gated communities. Boca Grande might just be the island paradise to call home. Boca Bay is one of the Islands premier waterfront communities. 7 neighborhoods each with its own distinct environment. Enjoy the Boca Grande Beach Club, excellent beach front resort style complex. Waterfront single family homes of Boca Grande Isles. These luxury homes overlook the protected waters of Charlotte Harbor. Boca Grande North featuring waterfront condos on the gulf and bay. Boca Grande Shores is a private group of single family homes right on the beach! The Dunes of Boca Grande beachfront villas. The Golden Beach area of Boca Grande consists of single family homes just to the south of town. Homes in Golden Beach can be on deep water frontage, those "Dam" streets, and deeded beach access. Stay at the Island House! Directly on the salty shores of the Gulf of Mexico. Marina Village at Boca Grande Club, overlooking Charlotte Harbor this quaint development is part of the Boca Grande Club. Onsite features include pool and boat dockage. Park Place condos are in the center of all the quaint charm historic Boca Grande has to offer. Sea Oats is an upscale condominium community surrounded by the tropical beauty of Boca Grande, FL. Seagrape Colony looks out right onto the Gulf Of Mexico! Vacation at Seagrapes two story beachfront villas. Seawatch is a premier gated community on 24 lush acres. Featuring villas and single family homes. Sundown Colony, an island favorite offering beachfront townhomes overlooking the warm Gulf waters. 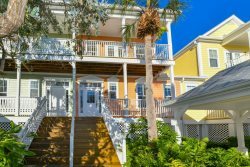 Turtleback townhomes located directly on the white sand beach of Gasparilla Island. The Waterway development on Gasparilla Island are waterfront single-family homes on boatable waters. Woodwind Beachfront homes on Boca Grande.